Good morning and welcome to week 5 of Countdown to Christmas with Sandi & Friends! You don't have to have many layers to a card to make it special, cute or beautiful! This week's projects is Sandi's NAPR idea (No Added Posted Required). No dimensionals are used in my sample, nothing with added weight (such as Filigree Brads or Clear Brads which you may guess is one of my favorite ways to add "bling" to a project). Instead, this week, I use the new Dazzling Details to give this otherwise "flat" card some "shine", and also use Nothern Flurry Textured Impressions Folder to add texture. You may not be able to tell well from the picture, but the Dazzling Details is added at the bottom of them, the snowy edge, but also to their hats and scarves, as wel as the decorations on the trees. Just love this stuff! If youwanted to step-up this card, where extra postage may then be required (LOL), you could trim this card and mat just the card front on a piece of Cherry Cobbler paper. Then add dimension by added a few cut out snowflakes or die-cut snowflakes with a rhinestone center! If you haven't already, sign up for the Countdown to Christmas newsletter in the upper right sidebar to get the free tutorial for this week's project! This looks like a simple card but is soooooooooooo cute. I have enjoyed all of your projects so far. Thanks. Very cute and sweet, LOVE the penguins...one of my faves!!! I am so lovin' this card. You did an awesome job! Thank you for sharing your creativity! Very Cute!!! Love the little "critters"...fun is being had. Take care of yourself and get better. Hugs Shelagh. Cute card, and penguins are definitely in season! lol Since I mail all my cards, I really appreciate the NAPR ones. I'm glad they've come out in thinner ribbons this year. Even just a knot of the bigger twill ones, costs an extra stamp! So cute! The happy little penguins make me want to dance! Love seeing what you do with the designs! Super cute! Love that it doesn't require extra postage! I really like that the card is NAPR and so cut, to boot! 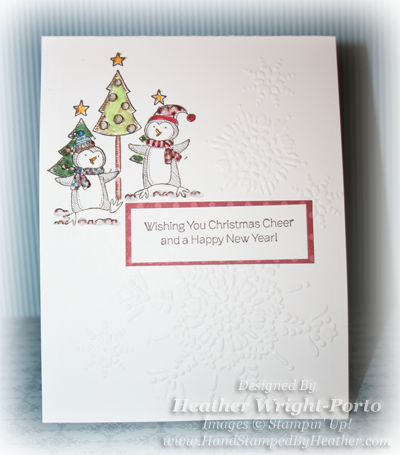 The embossing adds a great dimension tot he card. What a clever design ~ looks darling. Hmm, masking ~ not so sure I'd get that involved when mass producing but love it is NAPR. Great job, Heather! Heather, this is so cute, I love snowmen and you really made this one special. 'Love this card...'so adorable! 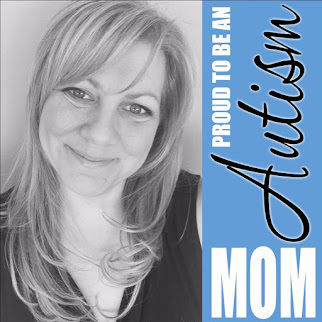 I really enjoy your blog...'thanks for sharing your creativity with us! Cute card and I love the stamp set. The embossing is perfect. Love your Christmas countdown. Hi Heather! What an adorable card you have made! Love the ef for texture and how the snow blends in with the stamped image. So cute!